Unilateral occipital flattening: Patients with positional plagiocephaly usually present with unilateral occipitoparietal flattening. Anterior displacement of ipsilateral ear: With increased severity, other findings include anterior displacement of the unilateral ear. Ipsilateral frontal bossing: A forward projection or bossing can occur in the forehead on the same side as the flattening. Bossing opposite occiput: There can be contralateral occipitoparietal bossing. Contralateral forehead flattening: The contralateral forehead appears flattened in comparison to the ipsilateral forehead. 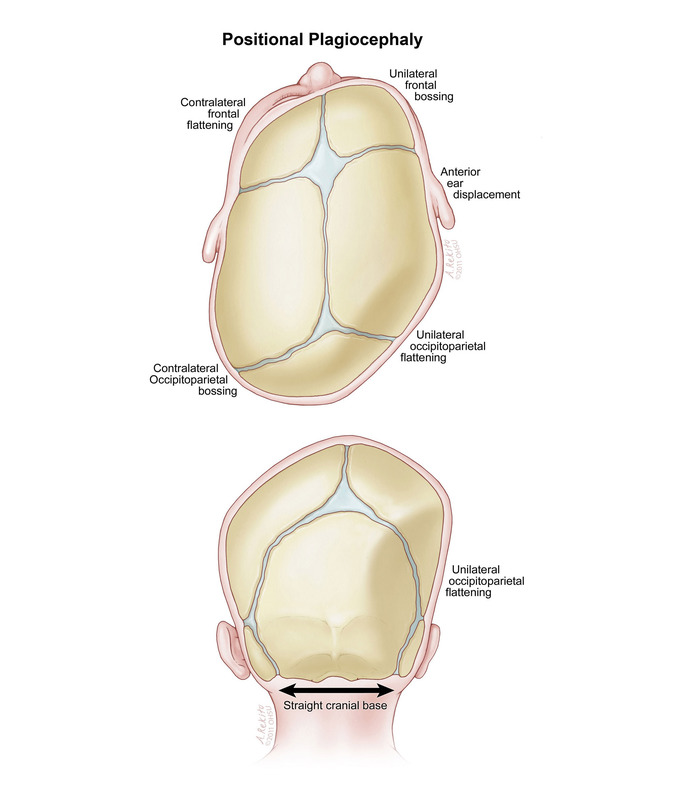 Positional plagiocephaly: Note the parallelogram deformity when viewed from top due to occipital compression pushing the ipsilateral skull forward, causing secondary anterior displacement of the ear and mid-face to a varying degree. Lambdoidal synostosis: Note the trapezoid deformity when viewed from top due to suppression of growth at right angles to the synostoses lambdoidal suture on the right. Overall appearance of parallelogram from above: Positional plagiocephaly gives the patient’s head a parallelogram shape when viewed from the vertex (35). Positional plagiocephaly can be differentiated from synostotic plagiocephaly on physical examination; lambdoidal synostosis is characterized by ipsilateral occipitoparietal flattening, but with the ipsilateral ear displaced posteriorly, contralateral parietal bossing, and contralateral frontal bossing. Additionally, with synostotic plagiocephaly, a view of the occiput reveals a tilted cranial base with mastoid deformity and a characteristic “windswept” deformity, as opposed to positional plagiocephaly, which lacks these deformities. 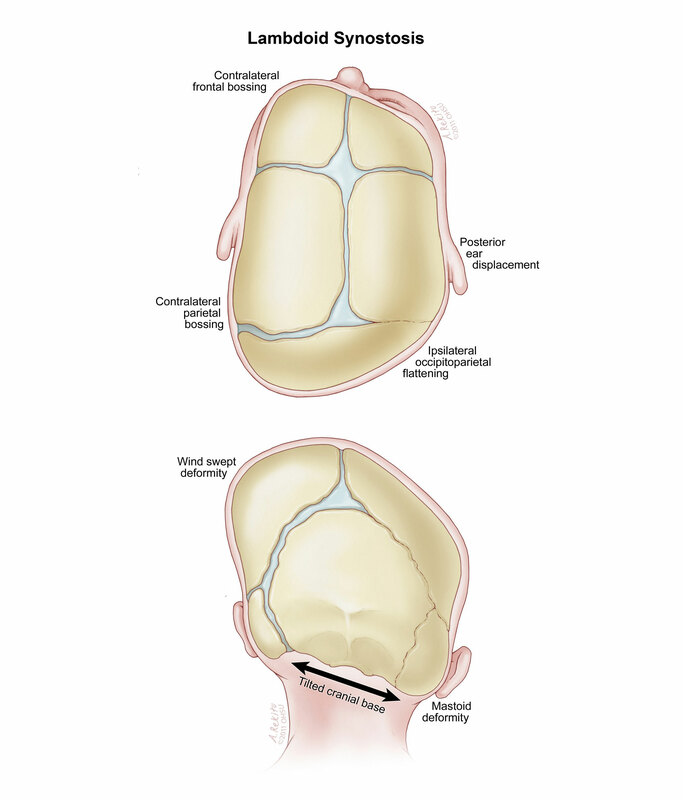 Bilateral flattening of occiput: Bilateral flattening, known as positional or deformational brachycephaly, has been reported to occur in 7–22% of infants with deformational cranial abnormalities (10, 28, 43). In such cases, with increasing severity, there is typically a central posterior flattening, widening of the posterior skull, and bitemporal bossing. Torticollis due to sternocleidomastoid injury: Associated torticollis can occur secondary to hemorrhage in the sternocleidomastoid muscle with subsequent scarring or muscle shortening caused by persistent unidirectional positioning and limited neck motion. The true incidence of torticollis in association with positional plagiocephaly is not clear. It has been reported to be from as low as 14.5–20% to as high as 79–84% (6, 24, 25, 28, 32, 36, 41). It is important to recognize and treat torticollis, as its presence can limit repositioning efforts. Rarely indicated: Diagnosis of positional plagiocephaly can almost always be made clinically by history and physical examination. Skull films or CT scans have been used but are not necessary and can lead to unnecessary radiation exposure. Ultrasound for suture evaluation: To avoid radiation exposure, ultrasound screening for fused cranial sutures has been successfully used (37, 42), with sensitivity 100% and specificity 89%, but is not needed for diagnosis. No indication: There is no role for nuclear medicine testing in evaluation for positional plagiocephaly. Unclear association with developmental delay: It is not clear if there is an association between positional plagiocephaly and developmental delay. No studies have evaluated developmental outcomes of infants with positional plagiocephaly in a rigorous manner. There has been some debate among investigators and some parental concern that positional plagiocephaly and cranial asymmetry may affect the child’s development in an adverse way. In some earlier series evaluating patients with positional plagiocephaly, 11.6–12.8% of infants reportedly had delayed milestone achievement (6, 33, 36, reviewed in 38). Possible association of delay with supine positioning: The early studies did not classify the degree or type of delay or use appropriately matched controls (7). It is possible that any developmental delay noted in patients with positional plagiocephaly is not directly caused by the skull deformity but is due instead to another underlying etiology. For example, pediatric primary care providers have observed that, in addition to decreased incidence of SIDS, infants who have minimal prone position time also had relatively delayed motor development. This delay resolved by 18 months of age. In a prospective study of 351 infants enrolled at less than 2 months of age, infants placed prone achieved their early motor milestones earlier than those placed supine (8). However, there was no difference in achievement of later motor milestones. This finding has been replicated (15), suggesting that prone position time may confound measurements of developmental delay in patients with positional plagiocephaly. Further work is required to address the true incidence of developmental delay in those with positional plagiocephaly. Examination: Head shape and abnormal passive range of motion in neck will differentiate positional plagiocephaly from lambdoidal plagiocephaly.